Varela, Lee, Metz & Guarino has once again been recommended by the Legal 500 United States as a top firm in the Construction practice area for 2018. Moreover, the guide highlighted the firm’s founding partners Paul Varela, Bennett Lee, Todd Metz, and Joe Guarino for their work. 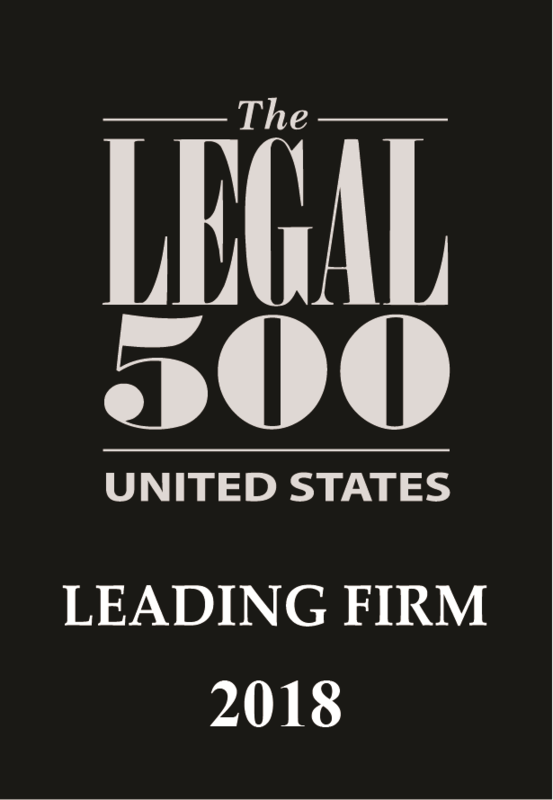 The Legal 500 guide recognizes that the ‘smart, thorough, responsive, strategic and service-oriented’ team at Varela, Lee, Metz, & Guarino, LLP is noted for its ‘knowledge of the construction industry, specifically in the complex areas of scheduling and delay damages and technical construction specification and design issues’. The founding partners are all construction specialists, namely Paul Varela, Todd Metz, Joseph Guarino and Bennett Lee, with ‘each bringing a different approach and style to litigating complex construction cases as well as an impressive command of industry knowledge’. Areas of specialty include the industrial, power and transport sectors. Varela represented a joint venture formed by three of the most prominent general contractors in arbitration relating to a $1.5bn classified US government facility in Utah and issues surrounding its electrical equipment as well as complex programming and quantum issues. Lee is advising Chicago Bridge & Iron Company in an ongoing dispute with Sinclair Oil surrounding an explosion in 2013 at Sinclair’s hydrocracker complex at a Wyoming refinery. Other notable clients include Chevron, Clark Construction and Kiewit. Named attorneys are based in the firm’s office in Tysons Corner, Virginia, save Bennett Lee who is based in its San Francisco office. The Legal 500 Series is widely acknowledged as the world’s largest legal referral guide. More than 250,000 corporate counsel have been surveyed and interviewed globally in the past 12 months. The Legal 500 is an independent guide, and firms and individuals are recommended purely on merit. The Legal 500 Series' analysis of law firm capabilities extends to 107 jurisdictions worldwide. The website www.legal500.com has 4 million unique individual users each year, including 2.5 million corporate counsel. Used by commercial and private clients, corporate counsel, CEOs, CFOs and professional advisers - as well as by other referrers of work both nationally and internationally - the series is widely chosen for its definitive judgement of law firm capabilities. Varela, Lee, Metz & Guarino has once again been recommended by the Legal 500 United States as a top firm in the Construction practice area for 2017. Moreover, the guide highlighted the firm’s founding partners Paul Varela, Bennett Lee, Todd Metz, and Joe Guarino for their work. The Legal 500 guide noted VLMG’s reputation for handling “bet-the-company litigation,” and recognizes that VLMG clients hailed the firm for its “business-minded, practical and experienced lawyers” and “successful litigators, who are very cost effective.” To see full rankings, click here. Varela, Lee, Metz & Guarino has once again been recommended by the Legal 500 United States as a top firm in the Construction practice area for 2016. Moreover, the guide highlighted lawyers Paul Varela, Mike Suga, Bennett Lee ('exceptional intellect', 'practical problem-solving ability'), Christopher Burke ('an unyielding commitment to a successful outcome') and Joe Guarino ('thorough and aggressive advocate', 'wealth of knowledge about the intricacies of construction law') for their work. The Legal 500 guide recognizes the value that VLMG clients find in the firm's "'commercially oriented' team" and "'technically proficient and thorough' partners who demonstrate 'passion for the cases they work on' and provide 'the quality of service of a larger and more established firm.'" To see full rankings, click here. Varela, Lee, Metz, & Guarino, LLP was established in March 2014 after 17 attorneys broke away from Watt, Tieder, Hoffar & Fitzgerald, LLP. The boutique construction firm has offices in Northern Virginia and San Francisco, and has already attracted praise for its ‘responsive, diligent, and efficient’ attorneys who ‘provide excellent value’. The firm specializes in complex litigation for large contractors as well as owners. Paul Varela, who has a ‘strategic, trustworthy, and tenacious’ demeanor, advises a number of large engineering and construction companies entities on cross-border matters. Joe Guarino is also singled out as an ‘extremely thorough and aggressive advocate’. The Legal 500 United States is a directory of leading legal practitioners compiled on the basis of independent, client and peer-based referrals. Their research is based on feedback from 250,000 clients worldwide, submissions from law firms and interviews with leading private practice lawyers, and a team of researchers who have unrivalled experience in the legal market.